Are you sure you want to remove Awful disclosures of Maria Monk from your list? Awful disclosures of Maria Monk: illustrated with 40 engravings : and The startling mysteries of a convent exposed! 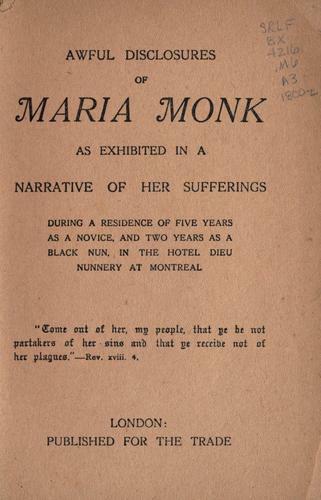 Awful disclosures of Maria Monk: as exhibited in a narrative of her sufferings during a residence of five years as a novice, and two years as a black nun, in the Hotel Dieu Nunnery at Montreal.